Servaris Next Generation Enterprize Servers built with Intel Xeon E5-2600V2 Series Processors is the solution for high volume memory intensive datacenter cloud hosting. Servaris E5-2600V2 Series Intel Xeon based Servers provide the most solid foundation for Virtual Machines by utilizing the latest technologies built into Intel Server Boards. All Servaris Next Generation Intel E5-2600V2 Series Xeon Processor based Server are built exclusively with the Intel S2600GZ. 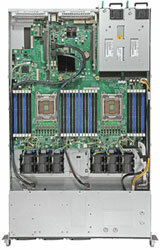 The server board provides 102.4 GB/s memory bandwidth with up to 768GB of E.C.C. Registered memory. With up to 12-cores per processor, Servaris E5-2600V2 Intel Xeon Rack Servers will provide you with the best performance and highest return on your investment.